97 London Road, Glasgow. G1 5NN. Over the years the Welcome Inn has become one of the best and largest Irish family run pubs in the city of Glasgow. The pub has grown over the years from a very small establishment, now it is three times it’s original size, taking over empty adjacent shops. The history of this old pub can be traced back to at least 1845, an old pub sat on this site owned by spirit merchant John Brown. Over the years many Irish publican’s have owned this establishment McMenemy, Meikle and Casey just to name a few. The pub then was very small compared to what it is today, six men at the bar created a crowd with no elbow room. The old pub was demolished and a new tenement with a pub on the ground floor was erected around 1875, the pub was then owned by Robert Paterson. James Riddell a well known and respected city publican took over the pub from 1883 to 1902, Mr Riddell also owned a pub on Nelson Street now called the Lord Nelson. James liked to move around, in the 1880s he was living in South Barrfield Cottage, East Kilbride, then to Bellahouston Terr, Ibrox before moving to Milton House, Dunoon. The Morrison family also ran the pub for many years, when George Morrison died his wife Louise took over the licence until the 1920s. Another family to hold the certificate for many years was the Eadie’s, the pub stayed in this family for nearly 30 years. The Hansom Cab Inn 1980s. 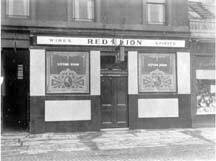 Over the years the pub has been known under many different names including Riddell’s The Red Lion, The Hansom Cab Inn which was named by Glasgow taxi driver Mr O’Hara. Frank McMenamin changed the title to the Welcome Inn around 1988, the pub is still in the same family today. If you intend to celebrate Saint Patrick’s Day this is the place to be, that’s if you can get in, as the place is backed full of party goer’s. The Welcome Inn, now three time’s it’s original size. Photo taken August 2005. The Welcome Inn is now closed forever. Developer’s have moved in and Welcome Inn will be demolished to make way for new houses. 2008. 1978-1969 Edward John Joseph Lynas. 1947 Mrs M A Eadie. 1920-1911 Mrs Louise F M Morrison.